Chrichton's World: Review Rocketman (1997): Very exhausting! 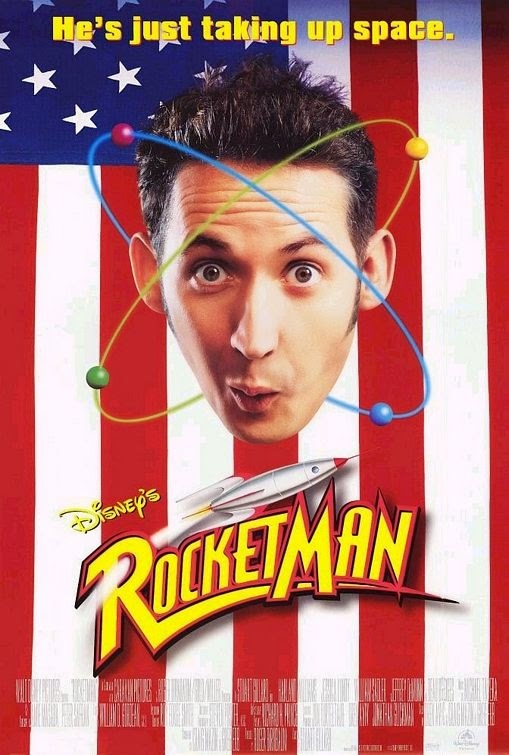 Review Rocketman (1997): Very exhausting! Rocketman is an exhausting movie to watch. For the right and wrong reasons. A lot of the comedy works because of Harland Williams. He might do the stupidest things but his charm prevents you from disliking him. The wrong reasons are that a lot of the jokes are of the slapstick variety. Which is fine but not if it is too childish. But it is and that is something you have to be in the mood for. It never lets up. It goes from one ridiculous event to another. It is simply too much. There is only so much abuse one can handle. I do remember having seen this film years ago and liking it very much yet can't recall much of it. Upon watching it the second time I remember. It was so overwhelming I blocked it out. Now there are some nice and sweet moments that make you care for the main character. And as I said a lot rides on Harland Williams and you will have a fun time if you can let go of all the ridiculousness that ensues. But can I recommend it? If you watch in the background when chatting to someone then I see why not? Or perhaps to keep your little ones occupied. I mean they will love the crazy antics for sure. To sit down and watch it with full attention though? No!